Israeli navy and soldiers attacked, Monday, dozens of Palestinian protesters, demanding an end to the deadly siege on the Gaza Strip, and injured 32 Palestinians with live fire, in addition to causing dozens to suffer the effects of teargas inhalation. The procession was organized by the Higher National Committee for the Great Return March, in the Gaza Strip, and was attended by hundreds of Palestinians along the eastern parts of the coastal region. Media sources said the protesters gathered the shore, while many boarded boats that sailed in Gaza territorial waters, before the soldiers and the navy opened fire at them. 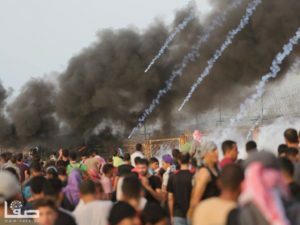 The Health Ministry in Gaza said that 32 Palestinians were shot with live Israeli army fire, and dozens suffered the effects of teargas inhalation. Most of the injuries tool place near Zikim military base, especially when some protesters managed to briefly cross through the northern Gaza, and the soldiers fired a barrage of live rounds at them. Some protesters also managed to cut sections of the barb-wire fence in northern Gaza, and raised Palestinian flags. 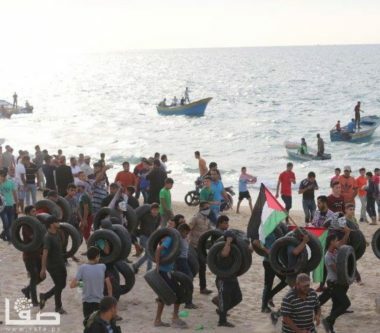 Many protesters also burnt dozens of tires to limit the vision of the Israeli army sharpshooters, in the sea, and across the perimeter fence. The Higher National Committee said the participation in today’s processions was the largest since the naval protests started, and added that the Palestinians are determined to continue the struggle for their legitimate rights, despite the escalating military violations, the fatal use of force, and the repeated threats by Israeli political leaders to wage a comprehensive war on the besieged coastal region.